We had two pet Degus. For people that do not know what Degus are, they are small animals about the size of Rats, but with most of their features a bit more like a Chinchilla, with a bit of Mouse thrown in for luck! The have the bad luck of being born basically Diabetic, so they have to have strict diets, without a lot of the nice treats you can give most other small animals. Degus also have tails that they can detach part of when attacked, it never grows back, so we are very careful to make sure ours keep theirs. We try to handle ours at least once a week, but they love to run and hide when you want to pick them up. The funny thing is that they seem relaxed once you have caught them. Their names are Thelma and Louise after the film of the same name. 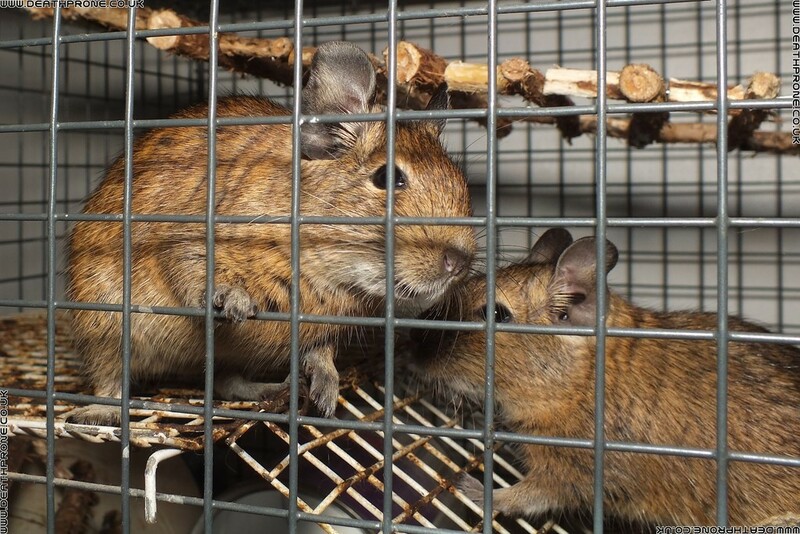 Degus make quite good pets, but as I mentioned in the poem they do seem to like to chew on the bars of their cage and in fact anything else they can get their teeth into. This means they need completely metal cages (not the usual ones with plastic at the bottom) and the chewing can be a more than a little noisy!